Watcher. Through this opportunity, there are total 564 vacancies will be fulfilled only by eligible and talented candidates. Candidates, who are eligible, can apply for this opportunity by send the application forms in proper way to get a secure place in this organization. Candidates who are interested in this offered opportunity and want to apply, firstly they have to clear that their eligibility criteria are match as per the requirements of offered post, if the candidates find to them eligible then can apply otherwise not. Now you are thinking that by which method you can apply for this offered opportunity, for this job opportunity candidate’s can apply by send the application forms in proper manner. Candidate’s who know that they are eligible as per the requirement they can apply on or before last date that is 03rd Week of May 2019. Hey guys keep remember this date because forms of all candidates will be acceptable only on or before last date. 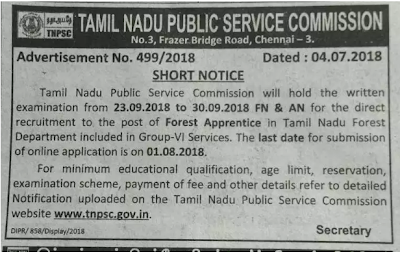 A fresh notice has been advertised by Tamil Nadu Forest Uniformed Services Recruitment Committee (TNFUSRC) for fulfil the requirement of nil openings for the post of Forest Guard/Forester. Under this recruitment opportunity total lots of vacancies will be filled only by eligible and talented aspirants. Candidates, who are eligible, can apply for this opportunity through online mode to get a secure place in Government Sector Job in Tamil Nadu State. Candidates who want to apply for this opportunity firstly they have to clear that their eligibility criteria are match from official requirements, if the candidates find to them eligible then can apply otherwise not. Now you are thinking that by which method you can apply for this recruitment, for this job opportunity candidate’s can apply via online mode. Candidates who know that they are eligible can apply online on or before last date. Hey guys keep remember this date because forms of all candidates will be acceptable only on before last date. Forester - Bachelor’s Degree in Science or Engineering with any one of the relevant subjects of any University recognized by the UGC. Forest Guard - Higher Secondary Course Pass with Physics, Chemistry, Biology, Zoology or Botany as one of the subjects. Forest Guard with Driving License - Pass in Higher Secondary Course (Plus Two) with Physics, Chemistry, Biology, Zoology or Botany as one of the subjects and also have a valid Driving license issued by the competent Transport Authority. Application Fee should be deposited through Payment Gateway by Online generation of Challan and payment at designated branches of Indian Bank. Selection Process: Selection of the job seekers will be made on the basis of Written Exam/ Document Verification & Interview Performance. First of all candidates must log on to the official website of the organization which is www.forests.tn.gov.in. Tamil Nadu Forest Department has transferred a new advertisement for educated aspirants to fill up nil vacancies. Online Application Form is invited from qualified applicants. Dear appliers of job, to appoint as Field Assistant & Forester, you will have to pass out the steps of selection method that is written exam and interview. Appliers need to do preparation to qualify by downloading official syllabus. Here are more content for TN Forest Department Recruitment which is provided through this web page. This portal states to the visitors that visit the official website of Tamil Nadu Forest Department that is www.forests.tn.nic.in. Academic Records: Job grabbers who are looking to apply they must have Bachelor’s Degree in science or engineering from any recognized institute or university for the relevant disciplines. Age Limitation: Applicants age must be minimum age 21 years and maximum 30 years. Age relaxation for the reserved category appliers will be given as per the government norms. On home page, find and enter on the ‘Notification’ option and read details for above posts. After successfully fill the form send to the address. Note: Dear candidates, to read entire content related to this post then will have to visit this link as Official Notice and Apply.